Anyone who read my last post has probably realised what I’m planning to do with Death Will Find Me, my 1920s-set crime novel. I’m going to self-publish it. It’s something I never thought I’d do, but I’ve run a publishing company, I’ve set up and run an award-winning independent bookshop, and becoming an indie author seems completely logical. I’m naturally entrepreneurial and now that I’ve made this decision I feel excited and positive about both the publishing side of it and my writing. This wasn’t an easy decision as I’ve been pretty scathing about self-published books in the past, especially when we owned a bookshop. Not without reason, to be fair, as some of them were very poor; unedited, full of typos, horrible covers, dodgy formatting, and so on. They may have been good books beneath that but I couldn’t sell them and had to regularly disappoint writers who hoped that our shop would be able to support them. Then came the first rush of e-books when the Kindle was produced and my goodness, there was some poor quality work there that didn’t help the overall image of self-publishing. But in the last few years, self-publishing has matured and there are some very professional writers coming through who are doing an excellent job and selling a lot of books. People like LJ Ross, JF Penn, Mark Edwards, Rachel Amphlett and so many more. And when I look at my manuscript, the one that has been praised so highly by industry editors but which they don’t think will contribute enough to their bottom line to be viable, I know that there is a readership out there and I know that I have the necessary skills to make a good job of publishing it. And my bottom line is a lot lower than that of a traditional publisher – as a friend of mine who is very profitably self-publishing after years in the traditional arena, pointed out, his overheads are probably lower than a lot of trade publishers’ window cleaning bills. He also said that since he’s taken charge of things, he’s now financially better off and creatively, he’s never been in a better place. That creative aspect is hugely important to me. 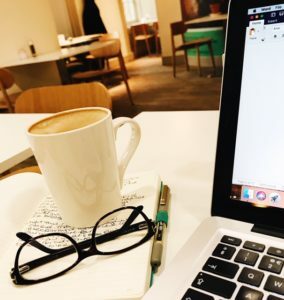 In the year that I was signed to an agent and my book was out on submission, I felt completely stuck writing-wise, all the joy of story-telling sapped out of me. I couldn’t write the second book in the series because that felt like tempting fate and when I wrote something new, something different to Death Will Find Me because I kept being told that it wasn’t saleable, my agent dumped me. There are new things I’ll have to learn – understanding how metadata operates for digital books and working out how to use Facebook and Amazon ads in cost-effective way, for starters. And there’s publicity and marketing. Instead of relying on a publisher to do it, I’m going to have to build my tribe myself. But then, I look at other traditionally published authors and many are having to do the heavy lifting of the publicity themselves. I’ll also have to learn to cope with people who sneer at the idea of doing this and who tell me that I’ll spend so much time marketing that I won’t have time to write. Or that I should pursue a trade publisher at all costs despite the fact that I look at some of the tiny ones and wonder what value they’re really going to add. But you know what, it’s readers and their opinions that matter, not people who snipe from the sidelines. Yes, I will have to invest money; good cover design isn’t cheap, qualified proof-readers aren’t cheap, and an experienced and knowledgeable editor isn’t cheap, but all are invaluable. And although I’ll be paying for it up-front rather than a publisher doing it for me, it’s worth remembering as someone pointed out to me last week, traditionally published authors are still paying for those things in the form of lower royalties. Much lower, in some cases. As for marketing, well, I don’t intend to be one of those people who endlessly spams their Twitter followers and Facebook friends with pleas to buy my book. I am in the process of setting up a blog tour so that I can talk about my book and the ideas around it with people who are likely to be interested, and I will use the aforementioned Facebook ads to a degree so that the people likely to be interested in Death Will Find Me know about it, but I plan to have fun with marketing the book, to do it in a way that entertains readers and makes me happy. And yes, maybe a bit more shameless hustling would sell a few more books, but that’s not me. I’ll trade a few sales for retaining my sanity and my integrity. Steadily building up a solid readership interested in my writing and the characters I create? Much more me. Over the next couple of months I’ll be blogging more about Death Will Find Me and why and how I wrote it, I’ll probably talk a little about the things I’m learning from the publishing process, I’ll share the cover design here first and in a few weeks I’ll also share the first few chapters of the book, hopefully to pique your interest in finding out more about Tessa Kilpatrick. For now though, I’m back to fact-checking and copy-editing before Death Will Find Me goes to the proof-reader and I’m thinking about the ideas that prospective cover designers are coming up with to make my book look fabulous. And I’m enjoying it. This entry was posted in My Writing, Publishing, Writing and tagged Death Will Find Me, editing, independent author, self-publishing, writing. Bookmark the permalink.